Trampolines hold fond memories for many of us – transporting us back to our carefree childhood days. The trampolines of today, however, look very different to the ones that we played on when we were young! In fact, they’ve changed a lot throughout history and are still changing today. Despite their seemingly simple structure, trampolines have evolved in many surprising ways. Not only has the look and design of the trampoline seen major transformations, but its purpose and use has also changed drastically over the years. There's evidence that, before the first trampoline was even invented, the concept of ‘rebounding’ and trampoline-like devices have existed around the world – dating back centuries ago. In Europe, people were once one of their number into the air on a blanket or piece of fabric. While this type of rebounding would often be for entertainment, some cultures had practical uses for it too. The Inuit people, for example, stretched out walrus skin to bounce people into the air so that they could see far into the distance. It may seem primitive today, but it was effective! Trampoline-like devices have also been used to save lives. From 1887 up to the mid-1980s, firefighters used life nets, which closely resembled trampolines. These nets were designed to catch people who jumped from buildings, bouncing them up and catching them again! The device featured a rigid circular frame and a round sheet of fabric stretched across the middle that was connected by springs. 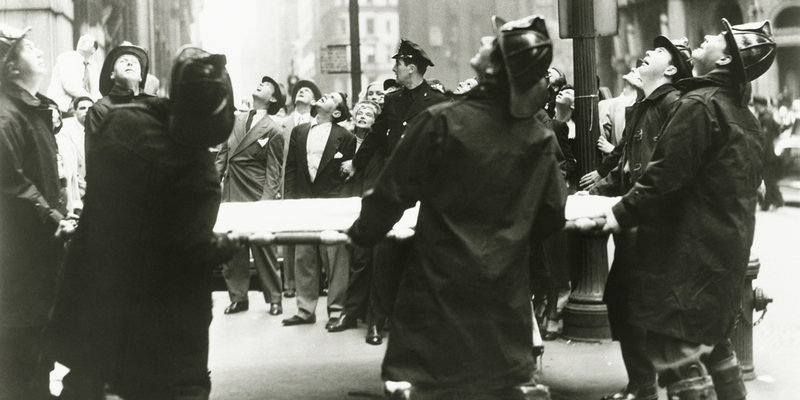 When used, 16 firemen would hold the rim at shoulder-height – ready to catch the person when they jumped. George Nissen invented the very first trampoline in 1934, after seeing trapeze artists bouncing into the safety net below whenever they performed their tricks. He thought of how wonderful it would be to create a device where those artists could continually bounce off the net and perform even more tricks. The first trampoline was little more than a stretched piece of canvas fixed to a rectangular iron frame with coiled springs. This canvas trampoline started out as a training device for tumblers, but by 1942 it was being manufactured commercially for recreational purposes. It was also used to train American pilots and navigators during World War II! During this era, trampoline design would be further improved by replacing the stretched canvas in the centre with nylon webbing, which – at the time – was being developed for parachute straps. This new material provided superior bounce and added durability. As the popularity of recreational trampolines grew, so too did the number of accidents. This made safety a key focus for future additions and changes to trampoline designs. Foam padding was one of the first safety measures introduced; it protected jumpers from the contact with springs when landing. Manufacturers then began including safety nets around the edges of their trampolines to protect jumpers from bouncing off the mat and experiencing fall injuries. Trampolining soon became popular as a sport, which resulted in design changes purely for competitive purposes. The trampolines used in competitions are to this day made from highly durable steel to ensure that they stay strong and stable after constant and repetitive. Many are also designed to be folded for easy transportation, using fabric that's extra-durable and often woven from webbing. In 1938, Ed Russell invented the first small trampoline. However, the design wasn’t patented until several decades later, in 1975. This type of trampoline is commonly used today for exercise and physical therapy. 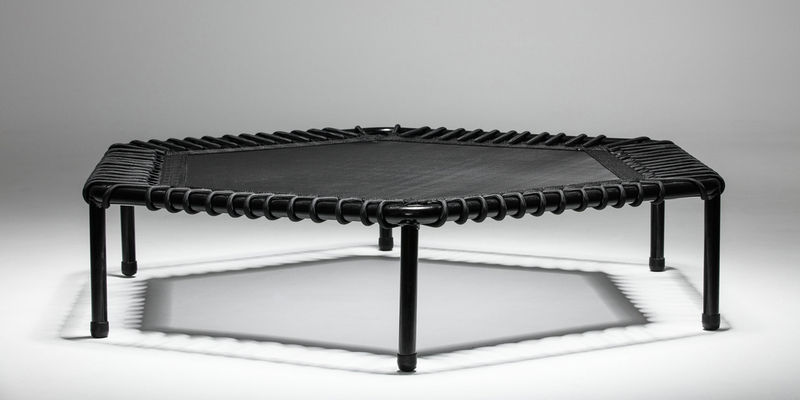 Mini trampolines (also called rebounders) are round, less than one metre in diameter and have six legs between 8 and 14 inches long. The mat is durable and elastic, and – instead of springs – some versions include bungee bands in the design. The early buzz around trampolines saw an explosion of trampoline parks in the United States in 1959 and 1960. These outdoor parks comprised multiple trampolines embedded into an elevated floor. While they were designed so that the jump mats were parallel to the surrounding surface to prevent falls, these parks nonetheless had high accident rates, and public interest in them eventually deteriorated. Trampoline parks have experienced a resurgence in popularity since 2011, with indoor trampoline parks adopting new and improved safety features to prevent serious accidents – including safety padding on walls and floors, as well as wall-to-wall trampolines that prevent falls onto hard surfaces. For a long time, rectangular trampolines reigned supreme in our backyards, but today, round trampolines are far more common. The round shape guides bouncers organically to the centre of a trampoline where it's most safe, and the shape itself is more naturally stable than the rectangle. Fabrics used on trampolines today are made from more durable and waterproof canvas or woven polypropylene. While the coil springs most commonly associated with trampolines are still present, alternatives to these traditional springs are available. At Vuly, we’ve further pushed the boundaries of trampoline design to create superior trampolines that are safer and bouncier than ever. We have created the unique Leaf Spring system for our Thunder Pro trampoline, which features zero coil springs to get caught in and no nuts and bolts that might loosen. This system – which was originally designed for the suspension systems of long-haul trucks – produces a bigger and safer bounce. We've also paired this innovation with a secure safety net to keep your kids bouncing safely. At Vuly, we believe that we’ve got the balance right between safety and performance to create safe and fun trampolines for a new generation to enjoy. Why not experience for yourself how far we’ve come in trampoline history by trying out a Vuly trampoline? Our trampolines include the latest innovations in trampoline technology paired with a modern design for superior looks, bounce and safety.